More Brooklyn: Greetings from Coney Island. Last weekend we spent a (sweltering) afternoon in Coney Island. We haven't been in years so we were curious what had changed. The future of the area is a pretty hot topic in Brooklyn so its forever in the papers for one reason or another - we weren't sure exactly what we'd find when we got there. 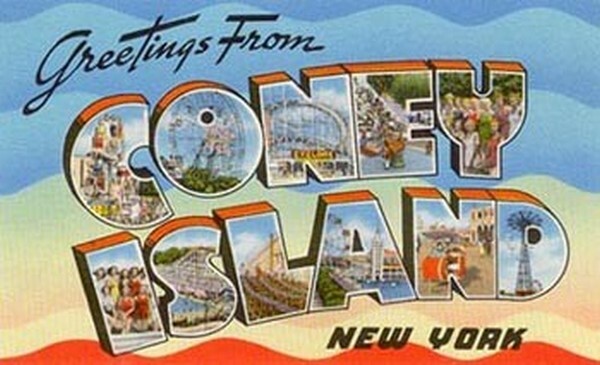 If you've never heard of Coney Island, its a neighborhood in Brooklyn that was once an amusement area. It reached the height of its popularity and poshness in the early 20th century. Since then its been on the decline but there have been some recent attempts to rebuild it into a major attraction again. (That's where the controversy comes in.) It's also where the famous hot dog eating contest is held every July 4th. The most interesting thing about Coney Island (to me, at least) is imaging the history. For example, check out this woman in 1947 hanging from a seat in the parachute jump ride. 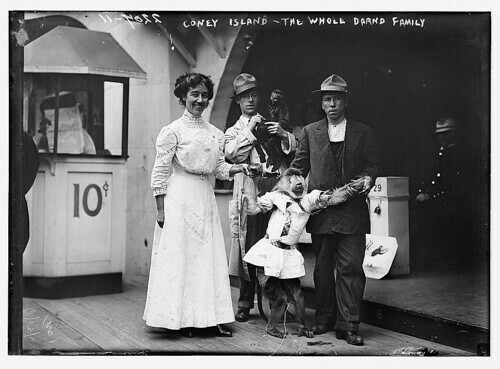 Or this Victorian family posing for a photograph at Coney with a dressed up monkey. Or this one taken in 1931. Have you ever seen a beach this crowded? This post is already getting so long I'm going stop with all the frivolity now and just show you the photos I took during our day. I will say, the history of the area is completely fascinating and I learned many things on this trip I had no idea about including how the baby incubator was a sideshow until it was accepted in the medical community. I had expected some major differences since my last visit but really, not much had changed. The same run down feel, the same crowds carrying beach gear, mostly the same rides and fantastically exaggerated sideshows. Love it or hate it, it definitely has personality. At one end of the boardwalk is the old parachute jump. No longer in use and decaying in the sea breeze - its a landmark and won't ever be torn down. The most famous hot dog place on earth. In case you are wondering, they serve frogs legs too. I think we have to come back here on New Years Day to see the Polar Bear Club swim. Compare and contrast with the 1931 photo above. About mid-way down the boardwalk, the Wonder Wheel dominates the view. How can you not follow a sign that reads 'Fun This Way'? Heeded the warning and picked a blue car instead. Trapped in our protective cage, up we went. Those cars really do swing! And creak and crack as if the metal structure is about to collapse. The breeze up there was kind of nice. We were back on the boardwalk after a couple of turns. The $3 admission was tempting but the stink coming out of this tent kept me walking. I wasn't tempted at all with this one. A fine specimen of Brooklyn life. I wanted to go on but they wouldn't allow me to take my camera. That was a deal breaker. I've been on before...its a great coaster for enthusiasts but really rough! You come home with bruises. At this point, it felt about 175 degrees and the novelty had most definitely worn off.  It was time to head back to the limestone for some air conditioning and refreshment. It was definitely a fun afternoon. Hope you enjoyed taking a trip with us. Oh, my kids would love this place! The photos are amazing, the perspective and colors! Oh totally loved this outing you had. I've lived in NY all my life and I have never been. I must made a trip to check it out! Thanks for the virtual trip! Thanks for getting back to me on the software question...hum, I am showing my ignorance! Great images! You capture the glamour of days gone by and the charm that remains. I cannot get past the amount of people on that beach. Unbelievable! I just read an article in the Economist about Coney Island! Great pictuers. You're so talented. Great post!!! Your captions were hilarious. :) I couldn't believe how crowded the beach was in that one photo. Holiday weekend?? I love Coney Island! I always make sure to stop by when I'm in town. Salt water taffy is my favorite. Vintage photos are so fun! Can you imagine wearing those high necked gowns in sweltering heat! Ugh! I love Coney Island! I worked the Mermaid Parade one year back when I was an undergrad. It was amazing and SO much fun! Maybe I'll do it again this year. Great shots! Coney Island Rocks! I haven't been there in a few years, but like you said..., it probably hasn't changed much!!! What a fun afternoon, I give you alot of credit going out in that heat too! Great photos! My uncle used to tell a story about how friends got him on this roller coaster and he so scared that he was going to go off into the water but it jerked around a corner at the last second. I wonder if it was the Cyclone? I will have to go someday. My parents grew up in NY (they raised us in CA) so I remember vacations there when I was little. I definitely remember Coney Island. Two things stick out in my mind, dripping heat and the best saltwater taffy. Yum, I can still taste it today. Thanks for bringing back memories. Fantastic pictures. I could look at old Coney Island pics all day long. Fascinating. Visit there today? Not so much. haha! The pic of that guy.... I was scanning through and thought, "Oh what a pretty mural.... WTF?!?" I love it! Thanks for the post. I've always been curious about Coney Island. I've never made it there despite always considering it every time I'm in New York. Great pictures! Coney Island is a classic! I wish I lived in NY!!! What a fun post! I lived in Brooklyn for a spell while at NYU. This is great ~ a nice walk down memory lane. Great pictures and I loved your commentary. I'm so glad you did this post!! I've heard so many stories from my fam, (many of whom are from Brooklyn & some who still reside there), but in all the times I've been to the city, Coney Island hasn't made the cut! There are some fab shots of it. A personal fave is the one of "The Whole Darnd Family" I LOL at that one. But seriously, you've taken some perfect snippets of it. Thanks for sharing!! I love your pictures and your comments are hilarious! I'm going to get there one day! I love your black and white photo of the cyclone sign. I love your blog! I also love all of the great pictures!! Such a delight...visiting your blog. It's like a rich dessert! I love these images. LOVE LOVE LOVE the photos! I want to blow up your image of the parachute jump and put it on my wall - it makes me so happy! I think I'd have to blow up the close up of the Wonder Wheel and put it next to it! I loved your beautiful photos of Coney Island. I've been there many times -- and we both know that in reality - it is not as magical anymore. Those old pictures are fabulous! I'm poking around online trying to find things to do in my 3.5 days in NYC! Not sure if I'll make it over to Coney Island in that time, though you've definitely made me want to go!